"Need a unique side dish substitute to plain rice? Try this." Heat olive oil in a large skillet over medium heat. Add cauliflower and cook until tender, about 10 minutes; season with salt and pepper. 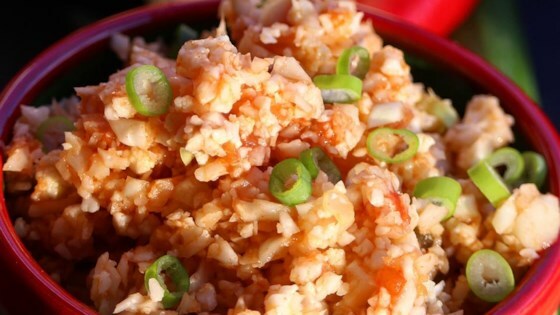 Stir salsa and green onions into cauliflower. Grate cauliflower using a grater or food processor. This is a low carb version of Mexican rice. It is very easy to throw together and very tasty, especially if you use homemade salsa. Thank you for the recipe. I used a food processor to rice the cauliflower. Added no salt or pepper. The salsa and green onions were perfect! Thanks for the great EASY recipe. Made it like the recipe and it was delicious. Loved it.